The Fan-tailed Widowbird was collected and formally described by Andrew Smith, a Scottish surgeon, explorer, ethnologist and zoologist. Smith organised an expedition to the interior and he travelled to near the Botswana border in 1834-35, collecting many new birds, reptiles, mammals and other taxa along the way. Smith described this species from a specimen 'obtained upon the south-east coast . . . in Caffreland' (Smith 1838). 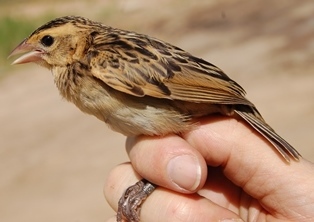 Smith actually described this species earlier, but did not provide a specific name (Vidua sp., Smith 1831), but he did give the locality as near the Kei River (Smith 1831), Eastern Cape, South Africa. The specimen could have been collected anytime between 1820 to 1831. 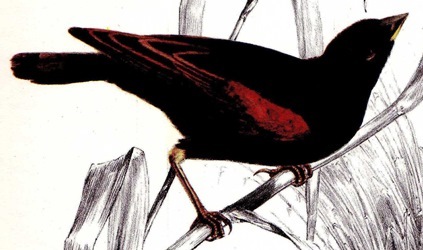 Smith crossed the Great Kei River on his trip to KwaZulu-Natal in 1832, but clearly he must have collected Fan-tailed Widowbird on an earlier excursion to the Kei. 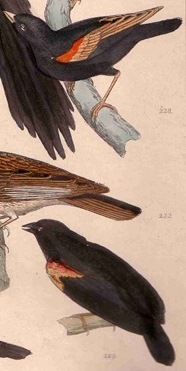 The first illustration of a Fan-tailed Widowbird was published by Andrew Smith in 1838 in Illustrations of the Zoology of South Africa, being painted by George Henry Ford. The next illustration was published in Reichenbach (1863), who painted 2 males in different poses. Vidua axillaris	Smith 1838; Illustr. Zool. South Africa, Aves, pl. 17 (and text);	'between seven and eight hundred miles to the eastward of Cape Town ... in Caffreland' = eastern Cape. axillaris - Latin: axillaris, of the armpit, shoulders or wing (axilla, the armpit, shoulder or wing; ala, the wing). Abyssinian Fan-tailed Widow-Bird, Benguella Fan-tailed Widow-Bird, Bocage's (Fan-tailed) Whydah, Bocage's Widow Bird, Epauletted Widow-bird, Fan tailed Widow Bird, Fan-tailed Whydah, Malandje Fan-tailed Widow-Bird, Natal Fan-tailed Weaver, Niger Fan-tailed Whydah, Nile Fan-tailed Widow-Bird, Red-shouldered Whydah, Red-shouldered Widow Bird, The short-tailed red-shouldered Widow, Zanzibar Fan-tailed Widow-Bird. Great Kei River, Eastern Cape, South Africa. Identification. 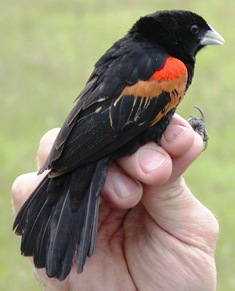 The Fan-tailed Widowbird Euplectes axillaris breeding male is black with a pale blue-grey bill, orange-red and cinnamon shoulder patch. The broad fan-shaped tail is much shorter than that of the Hartlaub's Widowbird F. hartlaubi. The non-breeding male is dull with heavy streaking above, a dark crown, conspicuous pale supercilium, red shoulder patches, and black primaries. The female is similar but has brown primaries, and duller shoulder. All ages and sexes have a distinguishing cinnamon underwing. 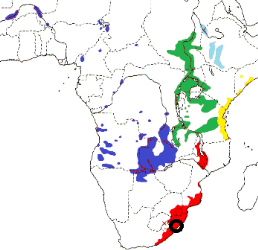 E. a. axillaris in the lowlands of Malawi, through Mozambique, to eastern South Africa (red on map). E. a. bocagei in West Africa from Mali south to Angola, Zambia, Caprivi area in Namibia, Okavango swamps in Botswana and NW Zimbabwe (dark blue on map). This race has a large bill, and the breeding male has orange-yellow shoulder patches above cinnamon coverts, making a broader epaulet than in other subspecies. E. a. phoeniceus in South Sudan through East Africa to NE Zambia and Malawi (green on map). The breeding male has orange (not red) lesser coverts. E. a. traversii in the Ethiopian highlands (light blue on map). This race is similar to phoeniceus but the breeding male has a proportionately longer tail, and the alula is usually cinnamon-brown. E. a. zanzibaricus along the coast from Somalia to Tanzania including Zanzibar and Pemba (yellow on map). This race is also similar to phoeniceus but the breeding male has a heavy bill and dark spots on the cinnamon wing-coverts. Habitat. The Fan-tailed Widowbird inhabits tall moist grassland and swamp edges, but at the coast also occurs in dry savanna and cultivation including sugarcane fields. It is gregarious, forming large post-breeding flocks. It roosts and feeds with other weavers. 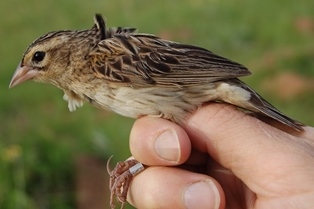 Ringed adults in South Africa have survived for longer than 9 years (see weaver longevities). Food. The Fan-tailed Widowbird feeds on seeds of grasses, herbs and rice; and also eats insects, including termites and caterpillars. Breeding. The Fan-tailed Widowbird is polygynous and territorial. A male owns up to 8 nests in his territory. The male flies over his territory in a slow, undulating flight, just above the vegetation, then suddenly alights on a tall grass stem. The male sings from a prominent perch, with epaulets conspicuous, and tail spread. If a female lands in his territory, the male displays with wings arched and spread, bouncing up and down in front of the female, and singing loudly. The male also sings at his nest frame, swaying from side to side. The epaulet colour is important in male-male interactions, while tail length is important in attracting females. The nest is an oval ball of thin woven grass strips, with a dense lining of seed-heads projecting from the entrance. The nest is attached to 2 or more stems of grass or other plants. The male builds the frame, weaving long grass strands into the bower of living grass. The female packs lining of up to 540 grass seedheads in the nest. The clutch is 2-3 eggs which are pale blue-green, irregularly marked with large olive or brown markings. Incubation is by the female only, as is feeding of the chicks. See all PHOWN records for this species here.